The Vendee Globe fleet today rallied around veteran French skipper Vincent Riou after he was forced to abandon his dreams of a second race win amid heartbreaking circumstances. Riou had been in fifth place and still very much in touch with the leading trio of Alex Thomson, Armel Le Cléac'h and Sébastien Josse when he was left with no choice but to concede with keel damage. The 44-year-old won the 2004/2005 Vendee Globe and was a hot favourite to take the title of this edition too but it wasn't to be - his yacht PRB hit a submerged object on Sunday night. Riou had hoped he would be able to continue but after inspecting the damage yesterday he found the keel pin, which attaches the keel to the hull of the boat, had been compromised. The end of Riou's race is all the more heart-rending because the damage occurred at exactly the same point - day 14 - that he was forced out of the 2012/13 race after hitting a metal buoy. 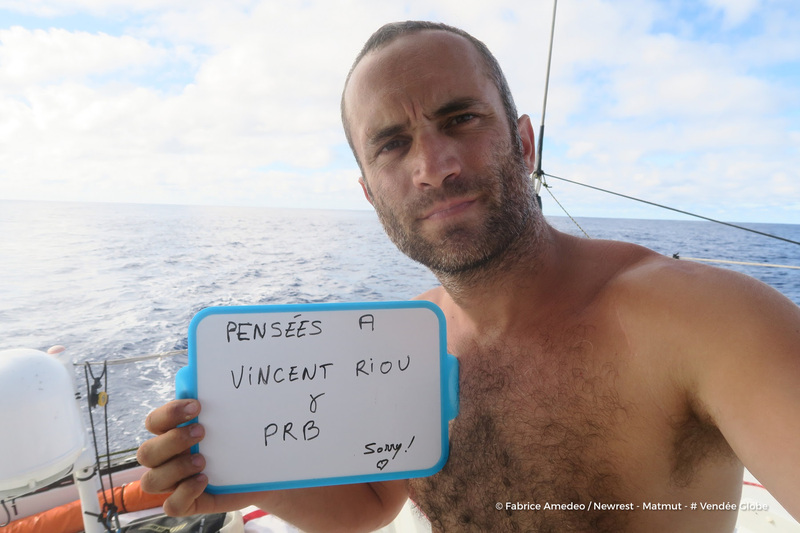 As the news of his retirement spread through the Vendee Globe skippers lined up to send Riou messages of support and condolence as he makes towards Cape Town to effect repairs. Race leader Alex Thomson said the news of the damage to PRB made him realize how lucky he had been for his yacht Hugo Boss not to suffer more damage when it too hit something in the water almost a week ago. 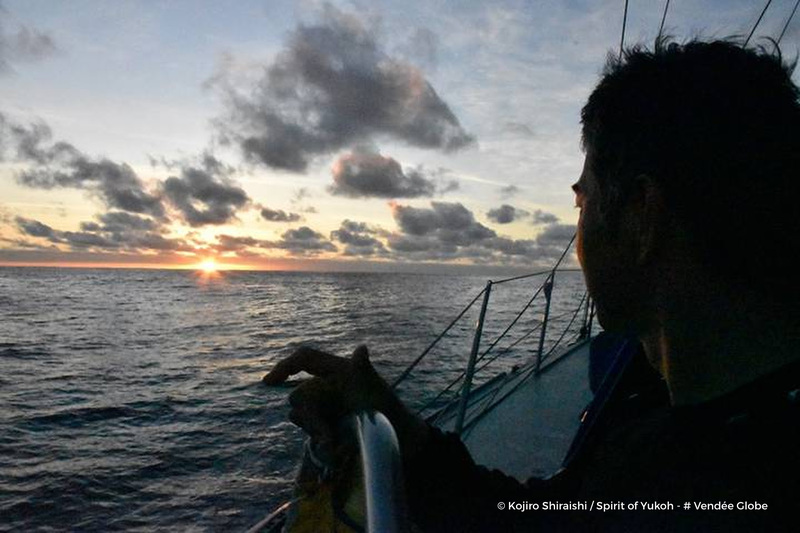 Thomson's starboard foil was damaged but unlike Riou he has been able to continue – and at the latest position update had a buffer of 102 nautical miles. "I really feel for the guy, he's one of the best out here on one of the best boats," Thomson said of Riou. "He was well prepared and it's horrible what happened to him. Last time he hit a mooring rope in the middle of the ocean. It's very sad, I feel very sorry for what's happened to him. Very clearly things could have been worse for me, but I'm still in the race. I'm still in the hunt so I carry on pushing, try my hardest and we will see what happens." Thomas Ruyant, skipper of 10th placed Le Souffle du Nord pour le Projet Imagine, added: "I'm really disappointed for Vincent. I've already sent an e-mail to him. He really gave us a helping hand when we were setting up this project; he is someone I have managed to talk to a lot and he always has good advice. It's a pity he has to leave the race so soon." Jean Le Cam, who won the 2013 Transat Jacques Vabre doublehanded race alongside Riou, said the incident served as a reminder that no boat is safe from unseen objects floating under the surface. “Vincent is one of the guys I appreciate, and this is the end of an adventure for him," he said. "We all know it is down to chance. There comes a time when you come across an object in the water. Life goes on and you have to bounce back. It's happened to Vincent, and will happen to others. You can have all the alarms you want, but if there's something there in the water, there's nothing you can do about it." Despite his clear disappointment, Riou was today pragmatic about the situation. "I'm heading for Cape Town and we plan to remove the keel very quickly," he said. 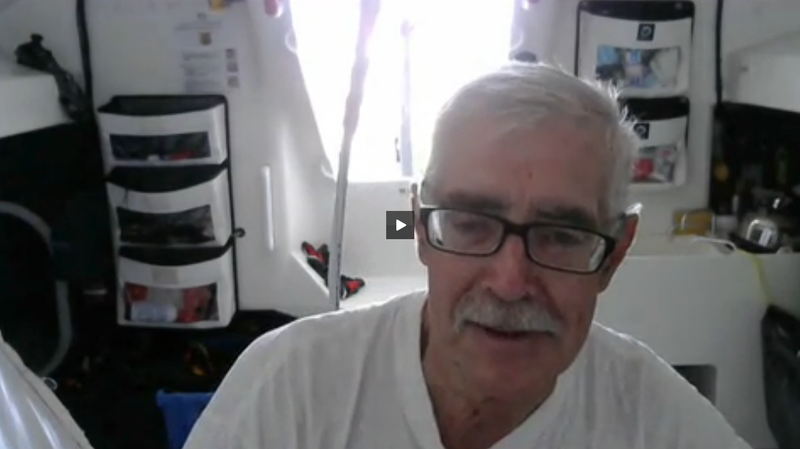 "The team is on their way with the parts and then I'll sail her back to Europe as soon as possible. When things like this happen, the quicker you move on the better it is for everyone." Riou is out but the race continues at breakneck pace. The leading trio have a 200-mile buffer on Morgan Lagraviere in fourth, while his rookie rival Paul Meilhat now lies 600 miles behind Thomson. Despite trailing by 1,000nm Yann Eliès is, incredibly, still in touch with the front pack in 8th place, but the big winner in the last 24 hours is Eric Bellion who has leapfrogged four places in the last 24 hours to now sit in 18th. 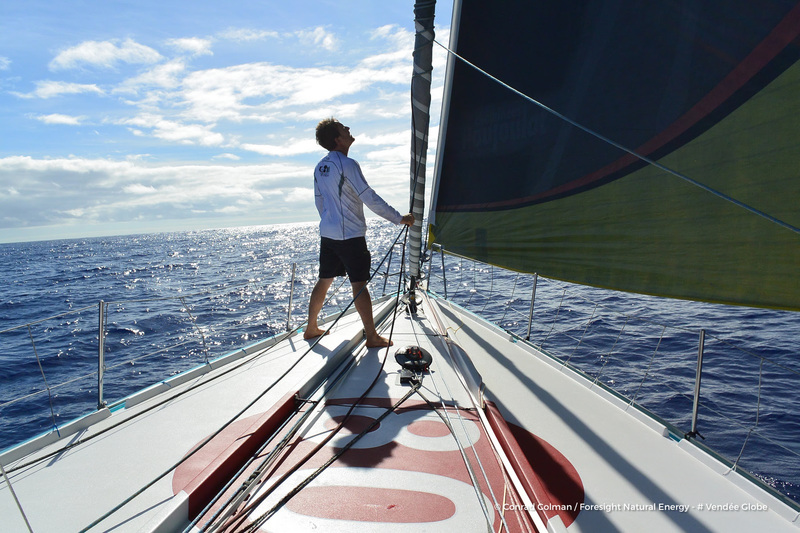 Alex Thomson (Hugo Boss): "The wind is very slowly going down. It'll be nice to have a bit of respite I guess. It's slowly going left, going aft. At some point I'm going to have to stick a gybe in. I think it's going to get very light for a while so it'll be interesting to see how it all pans out. Not everyone's dropped off this front – Banque Populaire and Gitana are still with me. It allows the gap to grow, which is good. It'll be interesting to see when the guys get into the same wind as me how much of a disadvantage I'm at without my foil. I think at the moment I'm in good wind and big seas, and the disadvantage of not having a foil is relatively small. 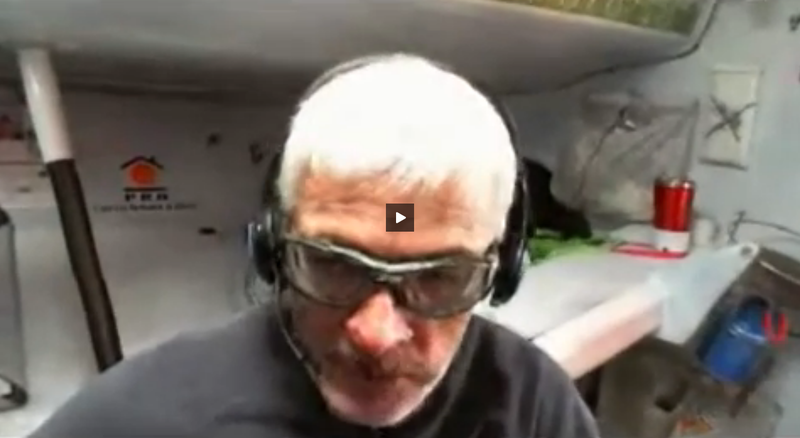 The thing for me now is that I can use my other foil so I'm praying the rest of the race is on starboard." Pieter Heerema (No Way Back): "The wind is bouncing up and down from eight knots to 14 and back, and the direction is east-north-east. Actually this light wind is a very welcome thing for me because I have three tasks that require a bit of a quiet period. I need to work on the rudder, which is quite dicey because I need to hang over the transom to do it, and I must not lose parts, then I have a foil that is stuck and I know I should not lose the foil, and I have a watermaker that doesn't work so I have to fiddle around with buckets of water in the boat." "It's sad for him [Vincent] – all the preparation and four years looking ahead. He so much wants to complete another Vendee and possibly even win it, though I think that was not in the cards. It's really sad that he's had to abandon more or less the same way as four years ago. It's scary how much there is floating around in the ocean. 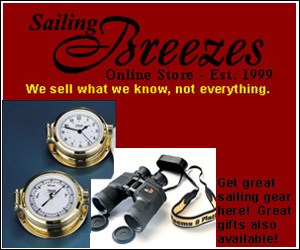 If you're on a slow boat doing eight or nine knots you maybe hear a thump and that's it, but on boats like we have, the speeds and forces are so enormous and the boats are so fragile that you can immediately have major issues. It's quite scary." Vincent Riou (PRB): "The problem today is that it is difficult to send waves into the water to detect objects. For a sonar to have such a range to change course, you're talking about devices weighing several hundred kilos, which use a lot of energy. In terms of our budget we haven't found anything reliable. They simply don't exist. It is however one of the main problems for us. I think at least ten skippers have hit something since the start of the Vendée Globe. 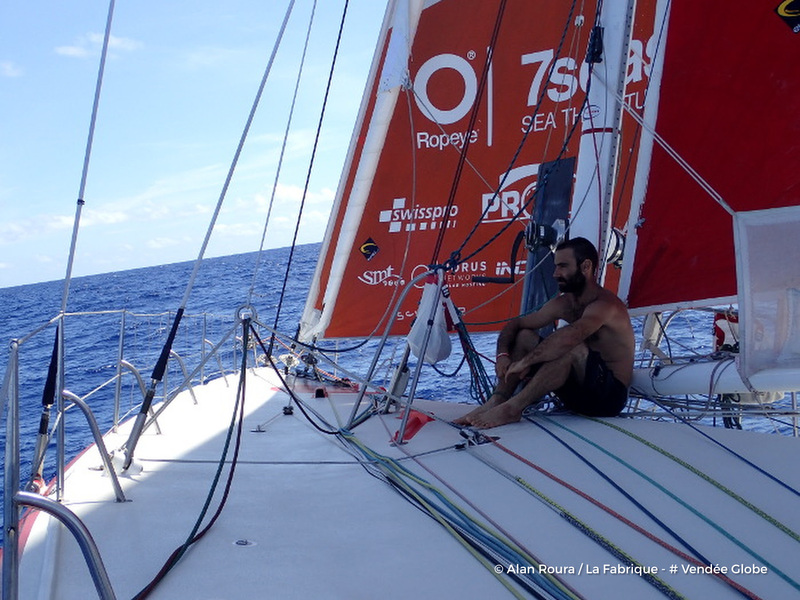 Some suffered damage like Sébastien Josse, whose rudder kicked up last night. Alex Thomson damaged a foil and I have been forced to retire. A week ago, I was maneuvering up on the bow when I went between a whale and a baby whale. There were just a few meters between them." Sébastien Destremau, TechnoFirst-faceOcéan: "I'm really upset about what happened to Vincent (Riou)… Bertrand de Broc and Vincent Riou were my neighbours on the pontoon in Les Sables d'Olonne, one to the right of me and one to the left. We spent a fortnight preparing alongside each other. Vincent is someone close to us. My twin brother has sailed a lot with him. We have a similar way of thinking. My boat came from South Africa, so I sent them a message in Cape Town to tell them that PRB was on her way and if they take care of her as they did with faceOcean, I'd be grateful. I'm really sad for Vincent."